The Baltimore Ravens defeated the Tennessee Titans, 21-0, in Week 6 of the 2018 NFL season. The Ravens didn’t have all that many big plays, but they chipped away all game to sustain a few long drives and dominate time of possession. Baltimore converted 13 of 18 combined third and fourth down attempts, five of which came on the ground. Michael Crabtree has had a rough start to the year, with a league-high eight drops through five weeks. However, he turned that around against Tennessee, catching six passes for a season-high 93 yards, a touchdown, and no drops. The Baltimore pass-rush as a whole unit deserves plenty of praise for their performance in Tennesee, but Za’Darius Smith was the star of the show. Smith led the Ravens with three sacks, including a strip sack in the first half that was eventually recovered by Marcus Mariota. It hasn’t been the best year so far for Ravens safety Tony Jefferson, but he had one of his better games of the season so far in Week 6. Jefferson got in on the sack party with one of his own, but he really made his mark in run defense, where he recorded several defensive stops. It was a lifeless performance from the Titans offense in this one. Tennessee had no answer for Baltimore’s pass-rush, which beat them all afternoon with a variety of blitzes and stunts, and they had guys ready to wrap Mariota up when he looked to escape the pocket. Tennesse couldn’t get anything going, whether it be on the ground or in the air. 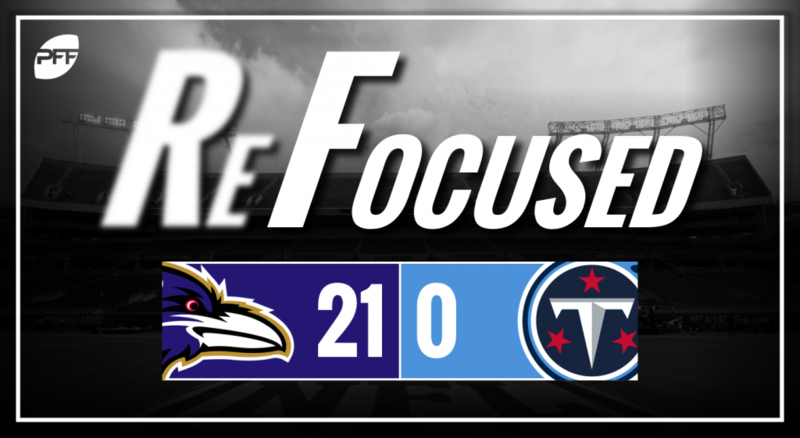 Tennesee’s running game was virtually non-existent against the Ravens. Derrick Henry and Dion Lewis combined to carry the ball 13 times, and they didn’t even crack the 30-yard mark. The Titans halfbacks didn’t force a single missed tackle on the ground all day, and they also didn’t pick up a single first down. The Titans’ defense really didn’t play all that bad. They allowed just over three yards per carry to Baltimore running backs. However, they just seemed to be unable to make the third-down stops they needed to make, even if they didn’t give up much yardage. The Titans did a pretty good job of pursuit and bottling up the receivers before they could turn their receptions into larger gains. Logan Ryan also had a nice pass breakup that led to a Kevin Byard interception. Baltimore: The Ravens were able to sustain long drives to chew up the clock, and they repeatedly converted timely first downs. Tennessee: The Titans had no response to Baltimore’s pass-rush, it’s tough to win a game when you’re QB is sacked on 11 of his 30 dropbacks.